This page explains procedures and methods to create a USB bootable drive or install Kodi into a USB flash drive. The instructions are written for Kodibuntu, but may work for other installs with ISO images. Warning According to the Kodibuntu page, Kodibuntu is no longer supported, and no longer readily available for download. Backup your data before proceeding. The instructions contained in this page will format drives and will destroy data contained in said drives. Note: This article uses the term "USB flash drive" instead of: USB stick, USB drive, thumb drive and USB HDD. Try Kodibuntu/Ubuntu or install it to your hard drive. Kodibuntu can be installed from a USB flash drive, much like Ubuntu. This may be necessary for netbooks and other computers without CD drives, and is convenient for others. Also, configuration changes can be saved on the USB flash drive, unlike a CD-ROM drive. Booting from a USB flash drive created with this utility will behave as if you had booted from the install CD. It will show the language selection and then the install menu, from which you can install Kodibuntu onto the computer's hard drive or launch the Live USB environment. Kodibuntu can also be installed to a USB flash drive, though the life-span of the drive may be reduced slightly, due to the extra read/write cycles that Kodi requires. A tmpfs can be created to mitigate this though it is not covered by these instructions. A 2GB or bigger USB flash drive. Files on this USB disk will be erased, so back up your data first. Make sure this USB disk is properly formatted and mounted. A Kodibuntu ISO file. See Kodi Download to download it. A Ubuntu image file. See [Download] to download it. Be aware existent data contained in the usb flash drive will be lost. NOTE THAT: Linux has many bootable usb creating tools, which some may work better than others, so if something fails, try another of these programs. Note: NEVER use one of your hard drive partitions in this process unless you really know what you are doing, as data will get erased. 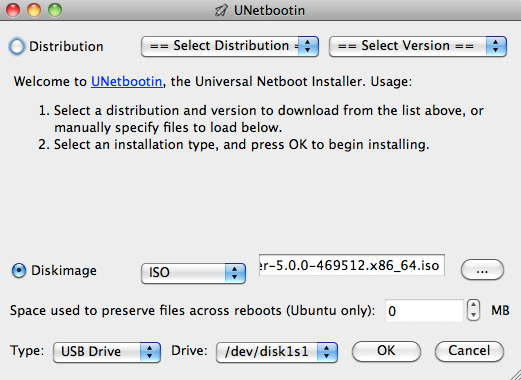 UNetbootin for Mac OS X can be used to automate the process of extracting the ISO file to USB, and making the USB drive bootable. The resulting USB drive, however, can be booted on PCs only. If attempting to make a USB drive that can be booted from a Mac, or if UNetbootin does not successfully create a bootable drive, follow the instructions below. To identify which drive to use from the "Drive" drop-down menu of UNetbootin, if you're uncertain which is your USB drive, open Terminal. Then run the command mount, and look for the line containing the name of your USB device in the /Volumes folder (e.g. /Volumes/usbdrive if your drive name is "usbdrive", as per the drive name in Finder). You will see at the start of that line the device path for your drive, which you can select from the "Drive" menu of UNetbootin. If you would prefer to use a USB bootable in Mac, please follow the instructions below. Note: This procedure requires an .img file that you will be required to create from the .iso file you download. Drag and Drop a file from Finder to Terminal to 'paste' the full path without typing and risking type errors. (replace /path/to/downloaded.img with the path where the image file is located; for example, ./Kodibuntu.img or ./Kodibuntu.dmg). Using /dev/rdisk instead of /dev/disk may be faster. If you see the error dd: Invalid number '1m', you are using GNU dd. Use the same command but replace bs=1m with bs=1M. If you see the error dd: /dev/diskN: Resource busy, make sure the disk is not in use. Start the Disk Utility.app and unmount (don't eject) the drive. Please notice: While all of the info and above commands are executed properly on a MacBook Air 3,2 (that is the 2010 version 13" version of the Air) the end result will not produce a bootable USB device, at least not with the image for Ubuntu 10.10 64-bit. When booting of the USB device the following message or something similar will appear: "Missing operating system" and the process is auto-magically halted. To get the USB device (e.g. a USB stick) to show up at all in the boot menu you also may have to reboot/turn on/off the computer a couple of times and also resync the partition tables using rEFIt. After doing this the USB should then appear as a bootable device while holding in the alt or c key when you are rebooting the computer. Notice that both the computers built in bootloader and rEFIt will identify the USB device as a Windows device, but that's not a problem and expected. 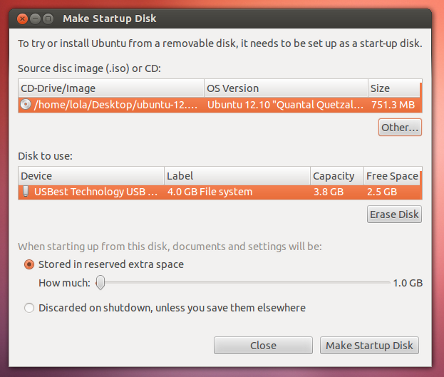 Create a bootable start disk using Ubuntu and a USB stick. Create a separate partition on the Airs HD. dd the whole USB stick to that partition. Resync with rEFIt. Turn power off and on. Alternatively, burning a CD and installing via an external CD-drive will work fine on the Macbook Air 3,2. Creating a Kodibuntu or Ubuntu USB disk is easy, including Live mode. Download and use Linux Live USB Creator aka LiLi. Select an ISO/IMG/ZIP file, or Download. If you want to create a Live USB choose the size of persistent data (usually between 250 MB and 2 GB or more depending on size of library and amount of artwork you likely to store in userdata). Note: Instead of usb-creator.exe you can use Unetbootin to create a bootable USB flash drive. http://unetbootin.sourceforge.net/ You won't be able to select the USB flash drive if it wasn't formatted in a way that Windows can see it. You may have to format it using Windows Explorer in order for it to show up in a creator tool. Instead of editing BIOS settings, you can chose a boot device from the boot menu. Press the function key to enter the boot menu when your computer is booting. Typically, the boot screen displays which key you need to press. It maybe one of F11, F12, F10. Note: with some motherboards you have to select 'hard disk/USB-HDD0' to choose the USB flash disk. If you need to edit the Boot Order, depending on your computer, and how your USB key was formatted, you should see an entry for "removable drive" or "USB media". Move this to the top of the list to make the computer attempt to boot from the USB device before booting from the hard disk. Note: Some Machines may not support booting from USB flash drive. Plop boot manager makes it simple to boot from CD and then boot from USB flash drive, you still require a CD drive in the machine via this method. Plop boot manager For more instructions and download. Your USB flash drive has a high read/write speed and is USB 2.0 or newer enabled. See A better way to create a customized Ubuntu live usb drive Note: Though it refers to Ubuntu you can adapt it 100% to Kodibuntu iso, since being a variant of Ubuntu anyway. Here is a way to create a bootable USB flash drive manually. The advantage is you don't have to empty your USB flash drive as long as you have enough space for the files. It also allows multi boot, so you can, for example, have your USB flash drive holding other OS and other Boot CD tools at the same time. Ubuntu 11.04 is having issues with USB flash drives from SanDisk that have U3 Launchpad. You can either use another brand or use either u3-tool from Ubuntu Repositories or SanDisk's U3 Launchpad Removal Tool to remove U3. Ubuntu 10.04.3 is having issues. You might get a segmentation fault if used from command line. There are many launchpad bugs regarding segmentation fault (eg: 572611). You need Mac OS X to create a USB flash drive that can boot on Macs. Even so, the process is less reliable than using a CD, as the USB flash drive is not always recognized on boot. Reversely, you can't create bootable USB flash drives for other platforms than Macs from withing Mac OS X. This is because Macs use a custom EFI bios with a custom boot-loader and need a special filesystem layout to boot correctly. If you are having problems not being able to get the installer to behave, below some steps that should correct that. Boot your system with the installer thumbdrive and select the "Try Ubuntu" option. This should boot into Kodi. Click the Shutdown menu in Kodi (lower-left corner) and select "Exit"
You should be presented with a log-in screen. Click "Other..." and enter Kodi as the login and select Kodibuntu from the dropdown menu (below the Login field). Click "Login" and you will be prompted for the Password; just leave it blank. Click "Login" again and the Kodibuntu desktop should be displayed. On the top-left corner of the desktop should be an icon to install Ubuntu. Double-click the icon and, hopefully, you'll get the installation wizard this time. These instructions have been adapted from the Ubuntu Community Documentation and credits for its creation are attributed Ubuntu Documentation Team as per their creative commons licence 3.0. This page was last edited on 20 June 2017, at 22:39.